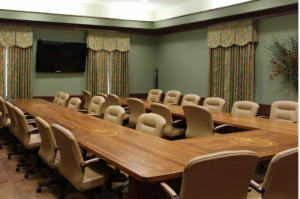 The CVB Boardroom offers the opporutnity to host meetings in an intimate setting, fit with all of the necessary components. The meeting space offers equipment to host any presentation, a TV, and wi-fi internet access. The meeting space can accomadate up to 32 people. Use of the facility is limited to Monday - Thursday, 8:00 am until 5:00 pm and Friday 8:00 am - 4:00 pm. Feel free to call (318-255-2031) or email frontdesk@rustonlincoln.com or reception@rustonlincoln.com for more information or to request a form!